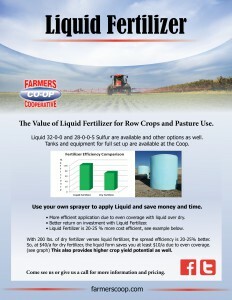 Liquid fertilizer is now availabe at all Farmers Coop locations. Liquid 32-0-0 and 28-0-0-5 Sulfur are available and other options as well. Tanks and equipment for full set up are available at the Coop. Want to save time and money? Use your own pasture sprayer! Liquid Fertilizer is essential to building and keeping a healthy stand of grass. Pastures, haymeadows and lawns have a high need for NPK, and without proper nutrients they will begin to thin. 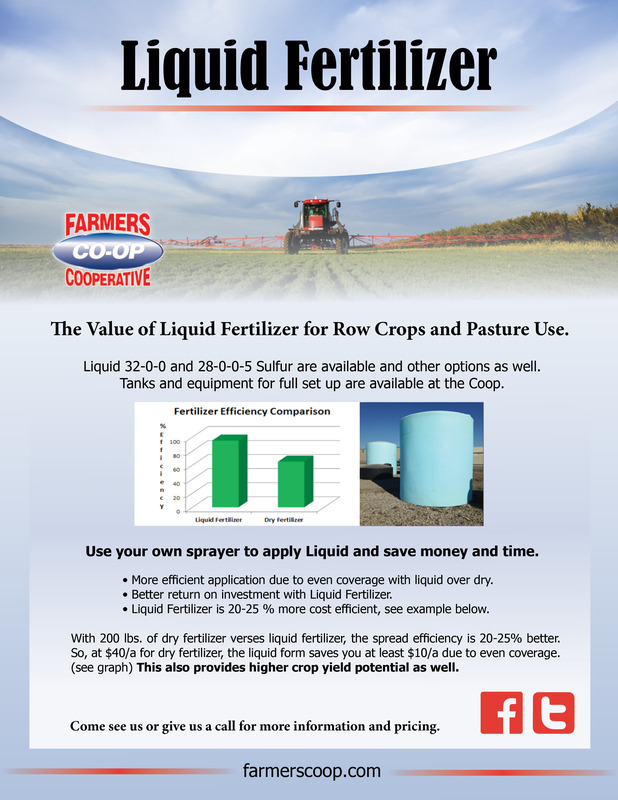 At Farmers Coop, we have the right fertilizers and equipment to meet your grass production needs. This also provides higher crop yield potential as well. Come see us or give us a call for more information and pricing. We happy to help. This entry was posted on Thursday, March 30th, 2017 at 8:43 am	and is filed under News & Updates. You can follow any responses to this entry through the RSS 2.0 feed. Both comments and pings are currently closed.